Every three years, plant enthusiasts from around the globe come together for one grand event which showcases the very best that the orchid kingdom has to offer. The World Orchid Conference was first held in St. Louis, Missouri in 1954 and, since then, has taken place in such distance places as Bangkok, Rio de Janeiro, Vancouver, and Johannesburg. This year, from November 7 to 12, Guayaquil, Ecuador was the host city. Attendees were treated to five days of lectures, exhibits, and sales opportunities from the biggest names in the sport. There was also plenty to do outside the convention as bilingual tour guides offered excursions to the jungles, cocoa farms, and the Galapagos. Two classrooms side by side hosted 90 concurrent orchid lectures with such fascinating topics as “Orchid Conservation in Colombia”, “Sustainable Vanilla Farming”, and “Ecology of Dendrophlax lindenii (Ghost Orchid) in Florida”. The more technical students were drawn to “Pendent Cymbidium Hybridizing” and “The Horticultural Potential of Chinese Cypripediums.” Nobody wanted to miss “First Ladies and their Cattleyas” as taught by this author. Local favorite Ecuagenera Orchids created the largest display with over 1000 different species and hybrids from a wide range of genera including many from native Ecuador. The plants were placed on long three-tiered benches at eye level which gave the audience a chance to walk right up to the flowers. The company is known for its conservation practices and has helped to identify hundreds of new species across the country. The Taiwan Orchid Growers Association, who was selected to host the next World Orchid Conference in 2020, created tall trees of yellow and pink Phalaenopsis. It was nearly impossible to count the number of flowers as there was only a mass of color. This exhibit was a crowd favorite and was situated near the entrance of the show. The best exhibit of the 22nd World Orchid Conference belonged to Thailand. This stunning over-the-top display featured large groupings of showy hybrids that had been naturalized in a woodsy setting using mosses and ferns. 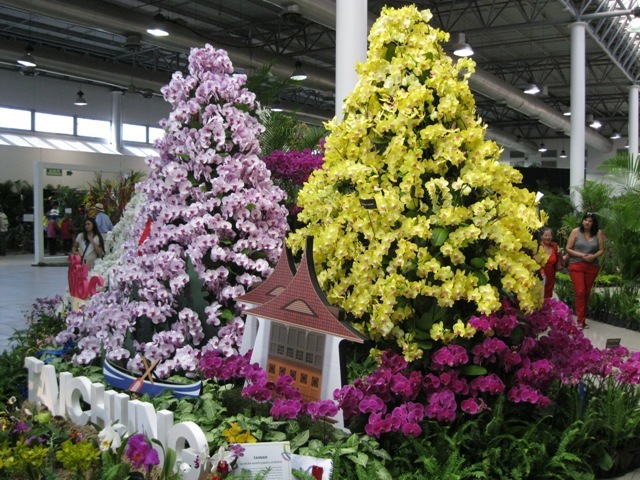 There were no Phalaenopsis in this display as the hybrids were representative of those orchids commonly grown by Thai farmers such as Dendrobiums, Oncidiums, Paphiopedilums, and Vandas. The groupings gave the impression of specimen plants. For example, at the top of one faux tree were dozens of bright orange Vandas tied together to look like a single century old plant. Upon close inspection, not one flower was bruised or faded. The Thai exhibit left even the most ardent enthusiasts bewildered as the quality of the plant material was exceptional and the volume of the blooming orchids was staggering. A quick count of just the lady slippers revealed over 500 Paphiopedilum spicerianum nestled among the moss-covered tree stumps. The ambitious architectural design included a sizable waterfall and pond area as well as partially fallen old growth trees that surely were fake but looked real. As if the lectures and exhibits weren’t enough, the sales area gave visitors a chance to take home an addition to their collection. International growers had traveled long distances to offer the latest in blooming plants, younger seedlings, and even test tube babies (known as flasks). For the uninterested spouses, there were local booths of Ecuadorian keepsakes such as boxes of chocolate, handcrafted nut necklaces, and authentic Panamanian-style hats. Next month, a look at ecotourism in Ecuador.